This presentation took place on Thursday, November 29, 2018. 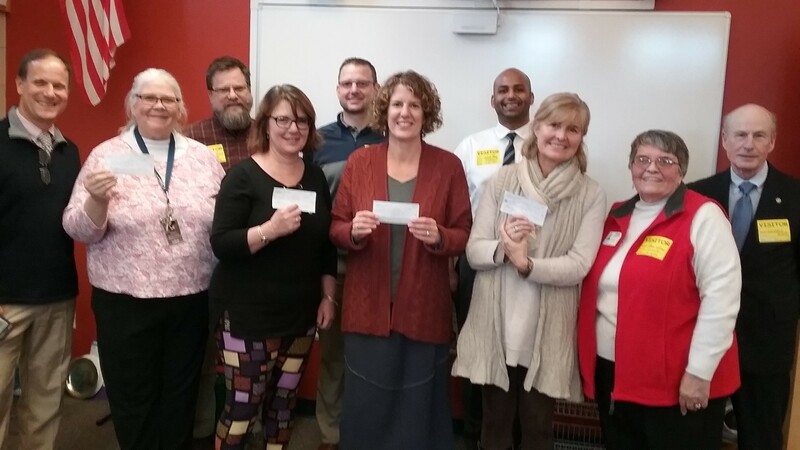 The club presented to each of the 4 Mitchell School 3rd grade teachers a check for $125.00 to buy books for their third grade classroom libraries. In the back are Rotarians Eric Waddell (Superintendent of Schools), Brad Hirst, David Fazzina, Samik Roy, Marie Williams and Lawrence Goff. The 4 teachers are standing in front holding their checks. 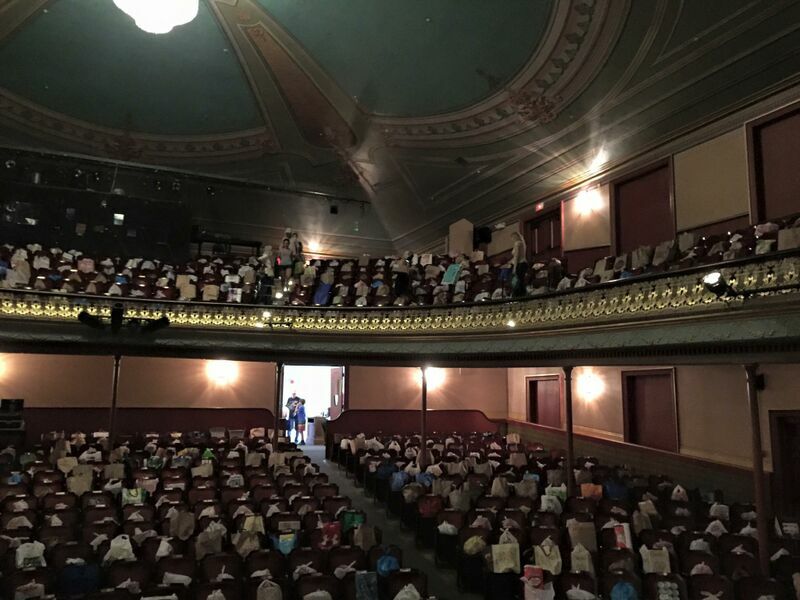 We have worked with the 3rd grades at Mitchell School for many years, first with buying individual dictionaries for each student and teacher in theses grades. Last year and this year we have given a donation of money so they could buy books the teacher and students would utilize in their individual classrooms and share with the other 3rd grade classes. Many of the pictures taken of our donation presentations or our local project involvement pictures are included in our weekly newsletters. We will be posting pictures of our donation events as they happen, starting with August 1, 2015. Please check them out. We provided the transportation for 5 Traip Spanish Students and two chaperones from Traip to Logan Airport and back. They left Friday, February 17, 2017 (see picture below) to spend the school vacation week in Mexico. They looked excited to be going!! They will attend a club meeting upon their return to tell us about their trip. 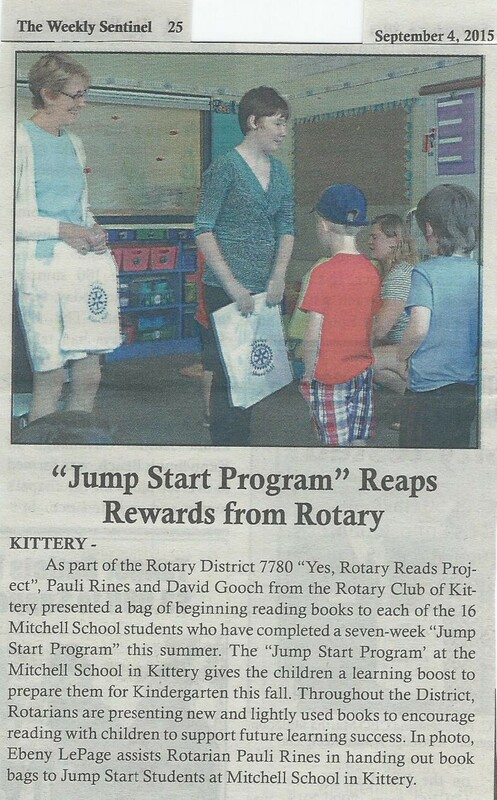 The Club provided the books for the "Jump Start Program". The Rotary Club of Kittery donated some of these bags!